This paper proposes a novel fall control technique based on energy concepts, which can be applied online to mitigate the impact forces incurred during the falling over of humanoids. The technique reduces the total energy using a nonlinear control tool, called energy shaping (ES) and further distributes the reduced energy over multiple contacts by means of energy distribution polygons (EDP). We also include an effective orientation control to safeguard the end-effectors in the event of ground impacts. The performance of the proposed method is numerically evaluated by dynamic simulations under the sudden falling over scenario of the humanoid robot for both lateral and sagittal falls. The effectiveness of the proposed ES and EDP concepts are verified by diverse comparative simulations regarding total energy, distribution, and impact forces. 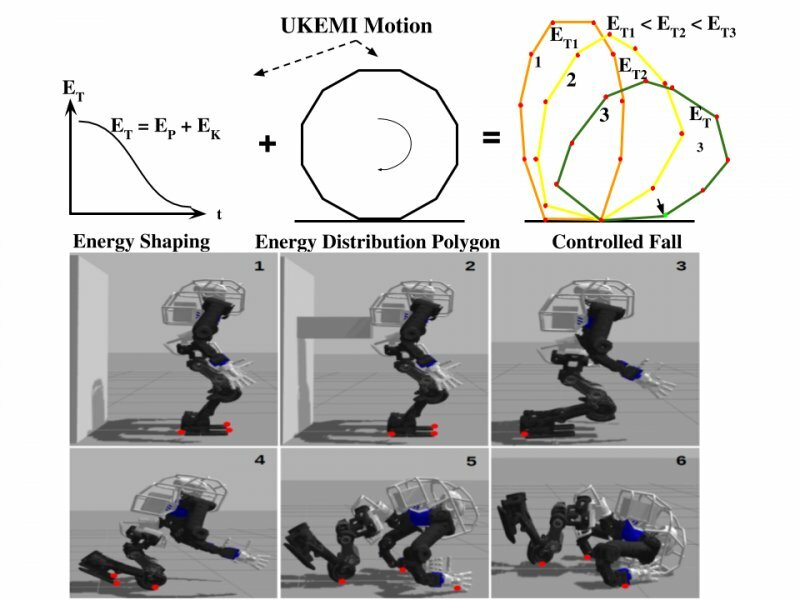 Proposed controlled fall concept and its numerical evaluation on Walk-Man humanoid. Energy Shaping based control law for falling motion generation to minimize energy. Energy Distribution Polygon to distribute the minimized energy over multiple contact points. Whole Body Control exploiting proposed energy based concepts using a single reduced model.